This lease is designed for a bank that occupies the ground floor, or a portion thereof, in a suburban office building or complex. The tenant receives an improvement allowance and is responsible for any costs of construction or finishing the premises in excess of the allowance. The lease is pro-landlord in orientation. This LEASE AGREEMENT is made and entered into as of the ______day of ____, 20__ , between _______________ having an office at _________ , hereinafter referred to as "Landlord," and ________________ having an office at ______________________, hereinafter referred as "Tenant." A. Landlord is the owner of an office building hereinafter referred to as the "Building," the address of which is _____________, and is currently know as ______________. The site on which the Building, its related improvements, and its accompanying parking are located is hereinafter referred to as the "Land." If the Building is part of a project, the project is hereinafter referred to as the "Project." B. Tenant desires to lease a portion of the Building from Landlord. 1.01 Landlord hereby leases to Tenant and Tenant hereby hires from Landlord those certain Demised Premises in the Building, hereinafter referred to as the "Demised Premises," the location of which is shown on the floor plan attached hereto as Exhibit "A" and by this reference made a part hereof, together with the nonexclusive right, in common with others, to the use of any common driveways, parking areas, entrance ways, lobbies, corridors, lavatories, elevators, ramps, stairs and similar access and service ways in and adjacent to the Building. The parties stipulate that the Demised Premises are deemed to contain ________________ rentable square feet (including common area factor), hereinafter referred to as the "Rentable Area of the Demised Premises." Landlord reserves from the Demised Premises space in the ceiling plenum, columns or other concealed areas for erecting, building, using and maintaining unexposed pipes, ducts, conduits, cables and wires leading to and from other parts of the Building, and reserves the right to change the arrangement and/or location of common driveways, parking areas, entrance ways, lobbies, corridors, lavatories, elevators, ramps, stairs, and similar access and service ways in or adjacent to the Building. 1.02 The Demised Premises shall be used and occupied solely for general office use, including banking and related banking uses and for no other purpose. 1.03 Without in any way limiting the use restrictions set forth in Section 1.02 above, it is specifically agreed that Tenant shall have no right to use the Demised Premises for any of the following purposes: lodging or overnight sleeping; food, alcohol or tobacco product sales or services; retail or wholesales or services; production, manufacture, repair or storage of goods, wares, or merchandise, except as such storage may be incidental to the use of the Demised Premises for general office use; medical, dental, chiropractic, pharmaceutical, physical therapy or rehabilitation offices or services; psychiatric, psychological or private counseling offices or services; travel agencies or services; public stenographic or typing offices or services; telemarketing, bill paying or collection services; security agencies or services; private investigation agencies or services; foreign or domestic government offices or services, embassies or consulate offices; immigration or naturalization counseling or service; banking, checking cashing or money order service; classroom instruction except for instruction to Tenant's employees; auctions; production, generation, manufacture, treatment, transportation, storage or disposal of hazardous substances (except as expressly permitted by Article 40 hereof); any use not permitted by applicable zoning or other ordinances; or any illegal activities. 2.01 (a) Landlord shall prepare or renovate the Demised Premises for Tenant's occupancy in accordance with the work letter attached hereto as Exhibit "B" ("Work Letter") and (if applicable) the space plan ("Space Plan") attached hereto as Exhibit "B-1," both of which are made a part hereof by reference and (if applicable) the Plans and Specifications (collectively the "Tenant Improvements"). Tenant hereby acknowledges and agrees that all monies actually expended by Landlord for such renovation work are deemed to be reasonably and efficiently expended by Landlord. The cost of all work up to a maximum of ________________________ (the "Allowance") shall be borne by Landlord. (i) Tenant shall pay to Landlord, prior to the commencement of construction of the Tenant Improvements, an amount equal to fifty percent (50%) of such Excess Costs (as then estimated by Landlord). 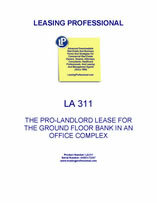 (ii) After substantial completion of the Tenant Improvements but prior to occupancy of the Premises by Tenant, Tenant shall pay to Landlord an amount equal to ninety percent (90%) of the Excess costs (as then estimated by Landlord), less payments received by Landlord pursuant to Section 2.01(b)(i) above. (iii) As soon as the final accounting is prepared and submitted by Landlord to Tenant, Tenant shall pay to Landlord the entire unpaid balance of the actual Excess Costs based on the final costs to Landlord within thirty (30) days after receipt of Landlord's invoice therefor. The excess Costs (if any) payable by Tenant under this Paragraph 2.01 shall constitute Additional Rent due hereunder at the time specified herein, and failure to make any such payment when due shall constitute a default of Tenant under Article 20 herein. 2.2 Landlord warrants to Tenant that the work performed by Landlord or Landlord's contractors pursuant to Section 2.01 hereof will be free from defects in material and workmanship Landlord's obligation under this warranty shall be limited to replacing or correcting any such defects which are discovered with one (1) year after the Commencement Date (hereinafter defined) of this Lease Agreement, provided Tenant gives Landlord written notice of such defect within said one (1) year period. This limited warranty does not apply to damages and defects resulting from abuse, intentional acts or improper maintenance, operation or use of the Demised Premises by Tenant, its officers, agents, contractors, employees or invitees. The foregoing warranty is in lieu of all other warranties, express, implied or statutory, including warranties of merchantability and fitness for purpose. In no case will Landlord be liable for special, indirect or consequential damages, including interruption of Tenant's business or use or occupancy of the Demised Premises, and there shall be no abatement of Rent (hereinafter defined) on account of any such defects in material or workmanship. 2.3 In the event Landlord permits Tenant to enter upon the Demised prior to the Commencement Date for the purpose of moving or installing any of Tenant's furniture, equipment, fixtures, business machines or other personal property into or upon the Demised Premises, or for any other purposes, the provisions of Article 9 (Alterations), Article 10 (Damage to Tenant's Property), Article 12 (Casualty Insurance; Mutual Waiver of Subrogation), Article 14 (Hold Harmless) and Article 15 (Liability Insurance) of this Lease Agreement shall apply and become effective as of the date of the first entry by Tenant.